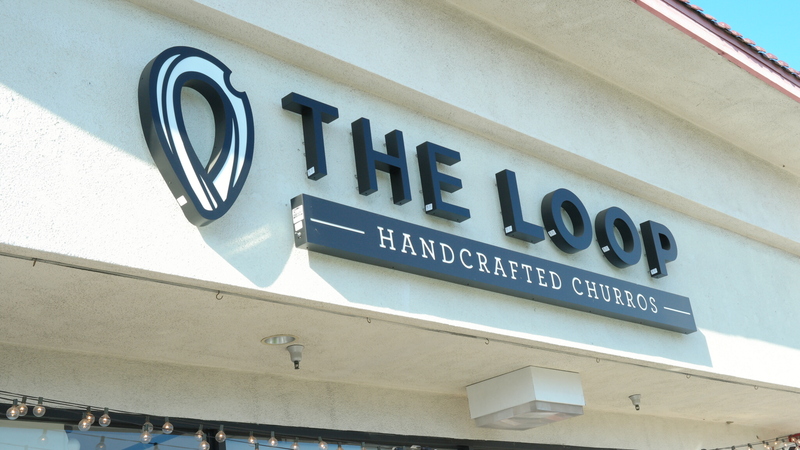 We made a recent stop on the way home from Disneyland to The Loop: Handcrafted Churros, named after the shape of the handcrafted churros they offer, which is located in Orange County’s Little Saigon community. 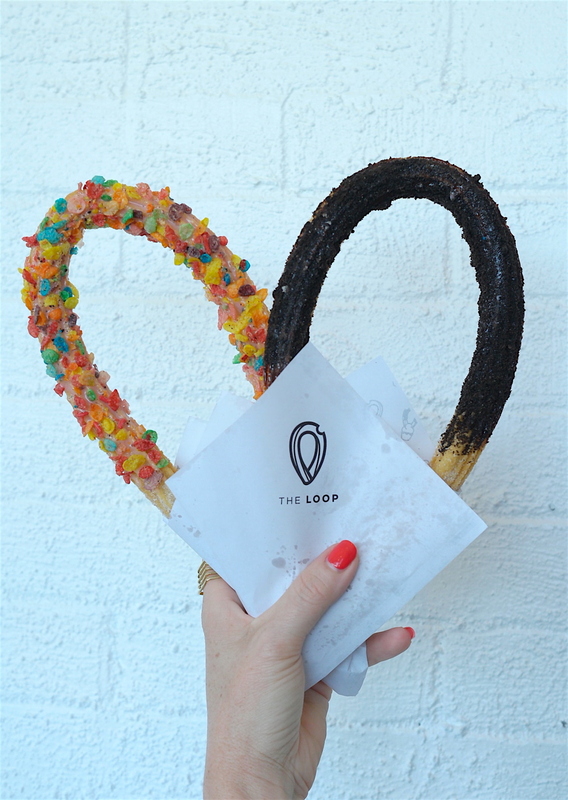 In a fun little twist on the classic Mexican treat, the Loop offers churros dipped, glazed, or chilled, meaning they come with an ice cream sundae. They are so insta-famous to me that I refused to head back to San Diego without getting my hands on some churros. We arrived expecting a crazy line considering it was a Saturday afternoon, but we got lucky and only had a couple people ahead of us. Although, after we ordered it was another story. Fun chalkboard menu on the wall behind where you order. You walk in to the shop and are greeted with the counter where the handcrafted churros are being constructed along with the cash register. Behind there is a chalkboard menu. However, it doesn’t list all of the different dips, glazes and toppings they offer. 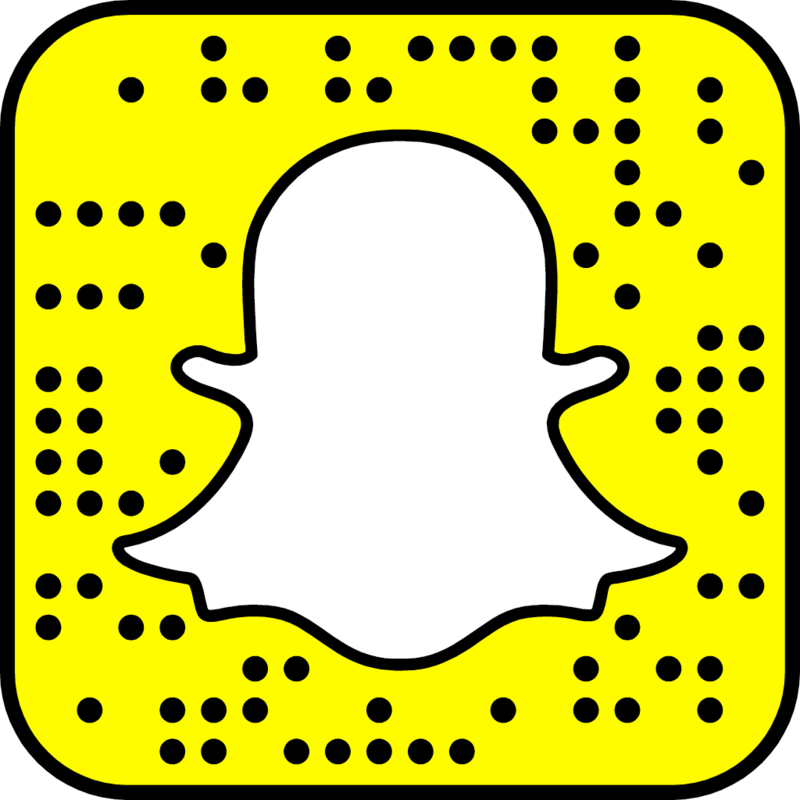 Total bummer, I missed that they have their own Snapchat filter until I looked back at amy pics. 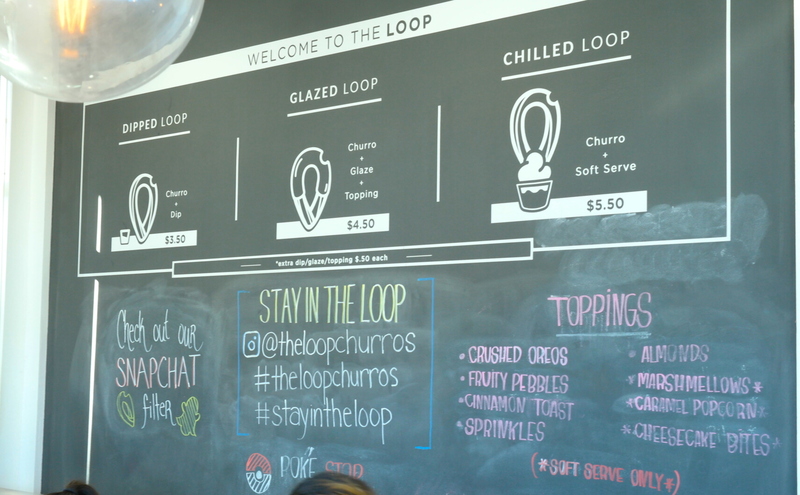 The Loops’s cheat sheet of combos to choose for your churros. I walked in feeling a teensy bit overwhelmed by all of the options, so I am one who really appreciates a cheat sheet like the one posted at the front counter before you hit the registers. First things first, you start with your churro, which you can opt to have coated with cinnamon-sugar or coarse sugar. If “Dipped” is your thing, it is a churro accompanied with a sauce of your choosing, dulce de leche, Nutella, strawberry or tiramisu. A “Glazed” churro means your churro is coated in chocolate, white chocolate, match green tea or strawberry glaze. This is when it gets fun, you can add toppings to the glaze like Fruity Pebbles, Almonds, crushed Oreos, or sprinkles. 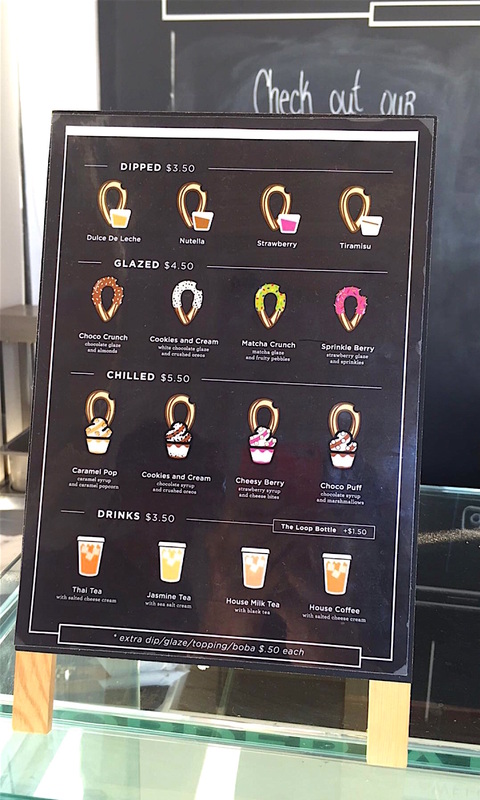 “Chilled” is what really had me wanting to get to The Loop, it is a churro placed in a cup filled with vanilla soft serve ice cream covered with caramel, chocolate, or strawberry syrup, and a topping such as caramel corn, crushed Oreos, cheesecake bites, marshmallows, Fruity Pebbles or Cinnamon Toast Crunch. 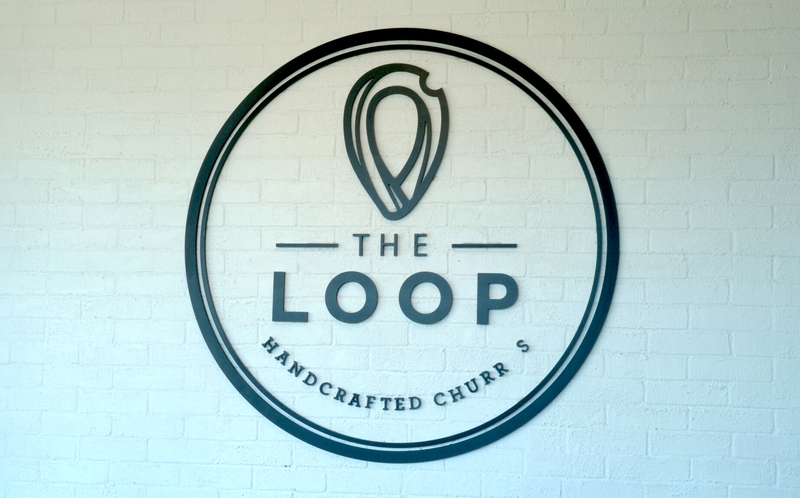 The Loop also has drinks to pick from, Thai Iced Tea, Jasmine Tea, House Milk Tea and House Coffee with salted cream cheese or sea salt cream. On their Instagram, they have been teasing recently about their “secret menu float”, it is Thai Iced Tea, Milk Tea or House Coffee with vanilla soft serve ice cream. Those stinkers, why didn’t I know about this little secret before I was there. It just means we need another road trip! We ordered two “glazed” sugar coated churros, strawberry glaze with Fruity Pebbles and chocolate glaze with crushed Oreos. I love caramel and popcorn and especially the two together so I had to get myself a Caramel Pop sundae. It tasted just as good as it looks! 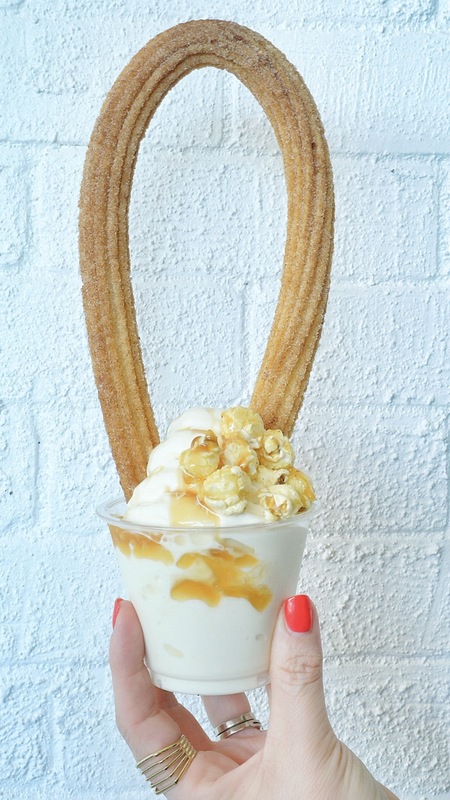 The warm churro melted the ice cream and caramel and kept the caramel corn crisp and never soggy. All of the churros were fantastic! They were warm and crispy on the outside, soft and doughy on the inside, just like a proper churro should be. I want to get back there like NOW and try more combos, plus get in on the secret menu. I mean a coffee float, YES! Very light and bright walls, perfect for photos! I always appreciate good walls for photo backdrops and The Loop is a food photographer’s dream. 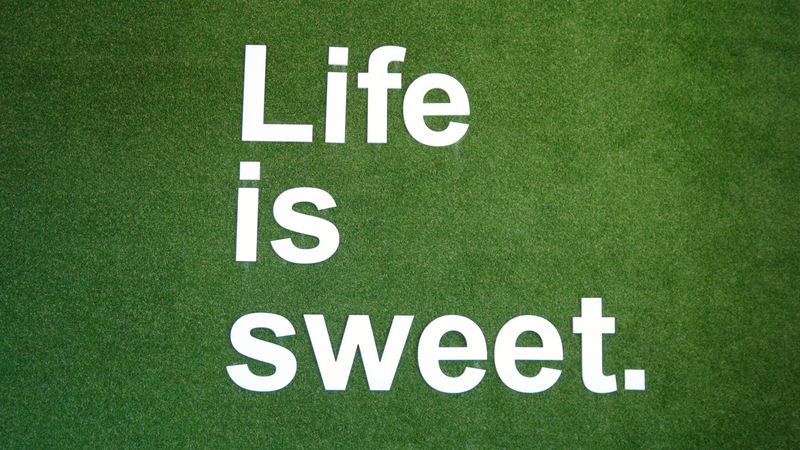 They have a lot of windows to provide light, a white brick wall and the cutest grass wall. One last tidbit to share about The Loop, they have a kiosk inside where you can take selfies with a special The Loop border. My kids missed that, otherwise we may have been there longer than anticipated. Not that I would have complained!